Well I'm in the thick of the Mother's Day crush, (it's almost worse than Christmas!). and if you happen to be a mom of a Grade 2'er from my school please avert your eyes. 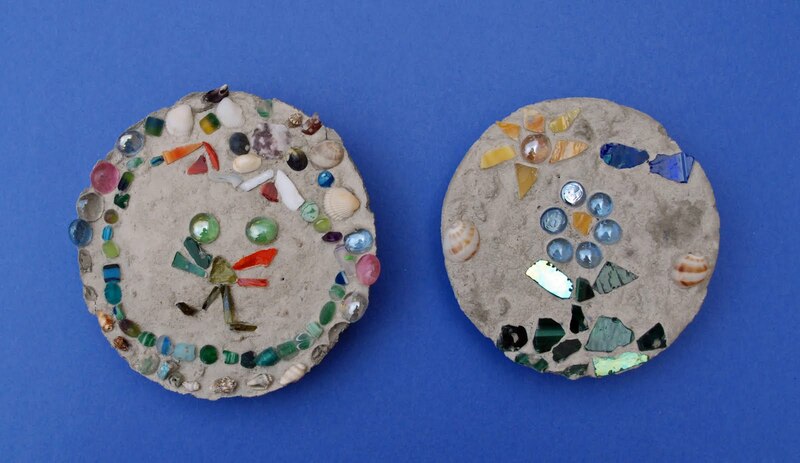 Here is a sampling of the garden stepping stones they made. I did not take step by step photos for this one partly because I was covered in concrete. Cameras and concrete don't seem to mix well. - a large pail you are not attached to, I used an old laundry detergent one, or if you are very ambitious a old wheel barrel. Prep: Have the kids draw out a simple design ahead of time. 1) Set out your bowls, if you are using chinette smear a little petroleum jelly in the bowl to keep from sticking. Set out your materials that the kids will be using in containers around the work space. 2) Wearing your gloves and mask, pour a little bit of water into your pail, this will help keep the dust down a bit, pour some concrete into the pail. Add water until it's the consistency of oatmeal. (Caution: it doesn't take much, it's like making icing, so add your water in small amounts). 3) Using your yogurt container scoop out some concrete and place in the bowl, leave a little room at the top as it rises up a bit after the kids start placing in their materials. 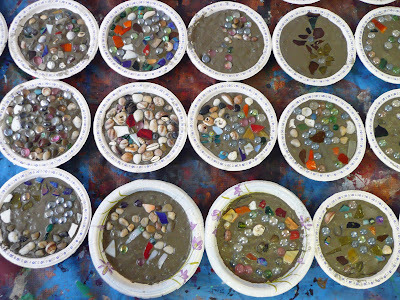 4) Thump each bowl a few times to get the pebbles in the concrete mixture to settle to the bottom, grab the rim and shimmy it a bit to get a nice level top. 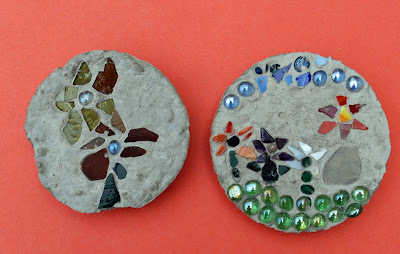 5) I asked the kids to make a design, but some just wanted to stick as many materials into the concrete as they could. Others started off with a great design but could not hold back from adding "more". Simple designs seemed to stand out the best. Make sure the kids push the materials into the concrete a bit. You don't want to submerge items but you also don't want to have items just sitting on the top especially the glass gems. You also don't want materials to be to close to the rim of the bowl as they just tend to break off. Try to leave a 1/2 an inch. Leave the stepping stones to fully set up for about 24 hrs. You can then remove them from the bowls and turn over to get the bottoms to fully dry out and cure for another few hours. Wrap in newsprint or tissue and you have a wonderful keepsake for Mom! Thanks for the idea of the bowl. 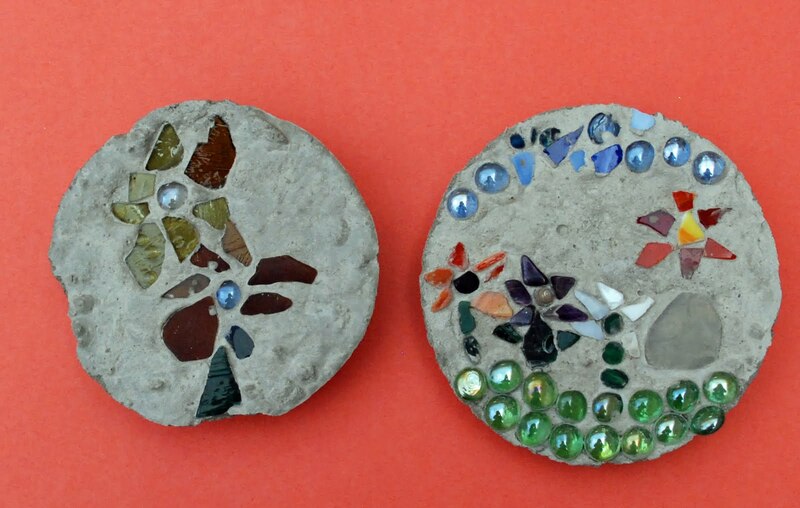 What about a Chinette paper plate for a larger concrete stepping stone? 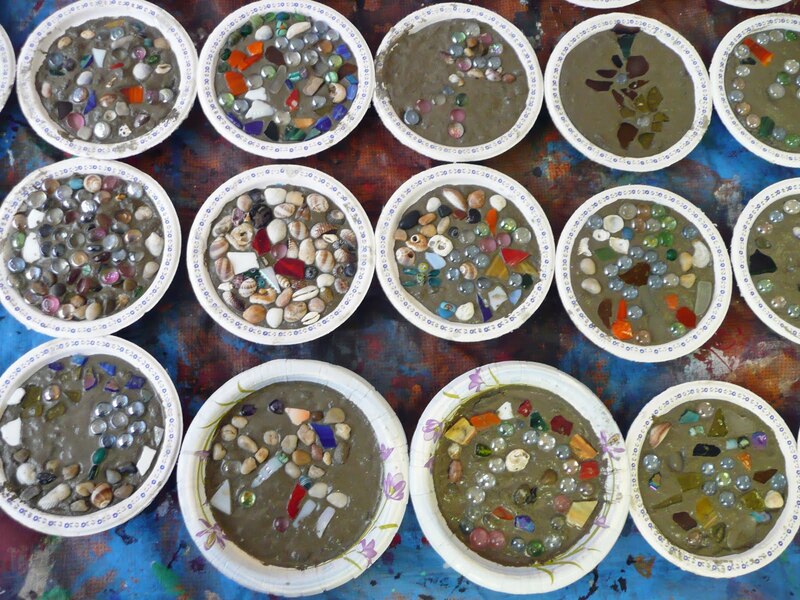 I have a yard full of square and rectangle stepping stones with stained glass mosaic I made. http://www.steppingstoneart.blogspot.com with directions. Flat marbles are the way to go with kids!